The Warden profession is ideal for those who desire to use harmonious magic provided by nature to fulfill a protective role in the world. The Warden serves their party by invoking their druidic powers to mend wounds and purge the effects of disease and poison that afflict thier allies. 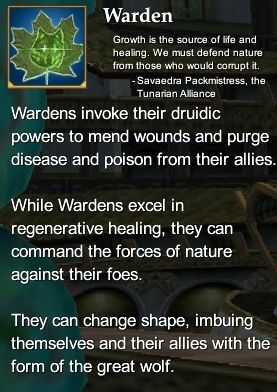 The Warden may also invoke powers to bestow temporary protective effects on and enhance the attributes of their allies, as well as hinder or harm their foes. Wisdom (primary) - Increases your damage and maximum power. Stamina - Increases your maximum health. Warden Epic Weapon Timeline (80) - Rise of Kunark Warden Epic Weapon. This page last modified 2011-08-25 22:53:09.